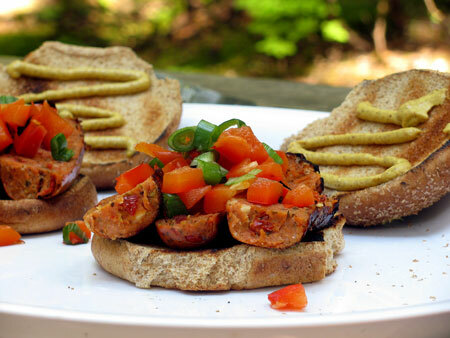 The next campfire recipe from our week long anniversary camping trip is a simple sausage sandwich that’s perfect after a long hike. 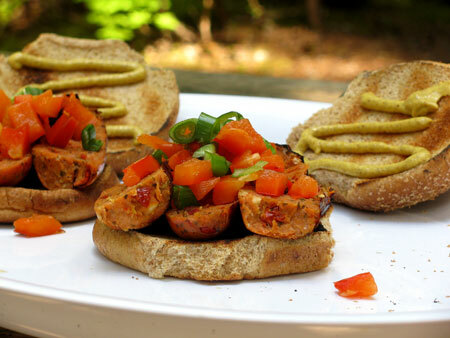 The sausages, buns and red pepper are all roasted over the campfire so that you don’t need to break out a camp stove or grill. But if you can’t imagine yourself “roughing it” in a tent, you can just as easily make these sandwiches on the grill for your next backyard BBQ. Mt. 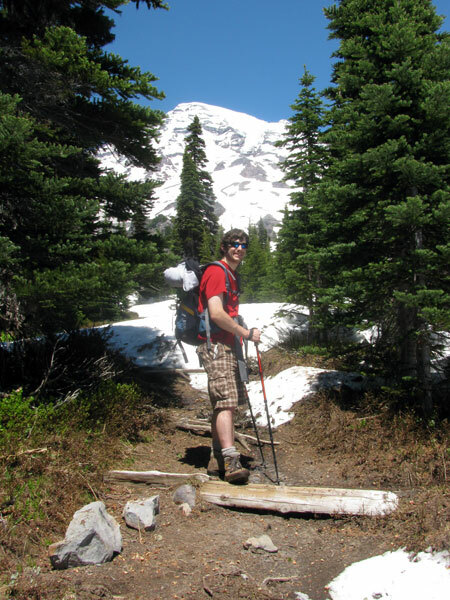 Rainier is full of fascinating plants, and the huge variety in elevations means that each hike you take offers a different assortment of trees, bushes and flowers. 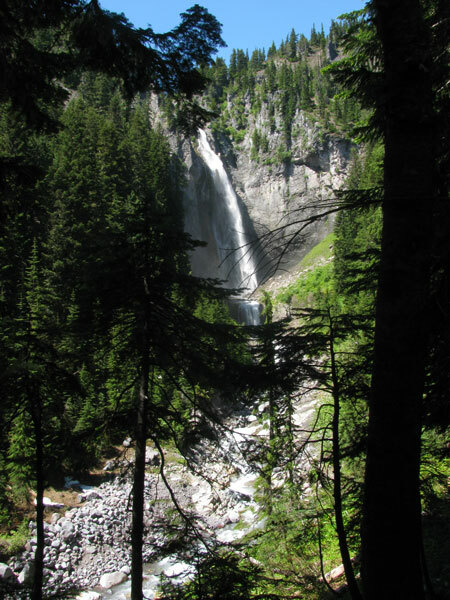 The hike to Comet Falls has a steep elevation gain that makes you certain with every step that you’ll have buns of steel by the end of the day. In fact if you go all the way up past Van Trump Park it’s over 2000 feet of elevation gain in less than 3 miles. Although it may sound exhausting, the hike is more than worth it for the view. Comet Falls is one of the most stunning waterfalls on Mt. Rainier. Like tiers of a wedding cake stacked in reverse, the largest plunge is over 300 feet and flows into 3 smaller plunges to create a vision that takes your breath away. The first time Eric and I hiked here was four years ago with friends after I first moved to Washington. Three of us decided to cool off by running under the spray of the upper tier. The glacier fed waterfall was like a blast of liquid ice down my spine, but no way was I letting anyone else know how frozen I felt. Eric got a little too close to the direct spray of the falls and was knocked flat by their power. Although his finger was badly sprained, he put on a good face and pretended everything was okay. We weren’t dating yet so I was careful not to show as much concern for his safety as I actually felt at the time! Although we originally planned to just hike to the falls, once again we decided to push on to a further distance and made for Mildred Point. The night before we attended a Ranger talk about Mt. Rainier history. The Ranger was a direct descendant of a woman named Mildred to hiked Rainier years ago and shared Mildred’s very inspiring story. We’re not sure if the point is named for her but when we saw it on the map we had to hike there. 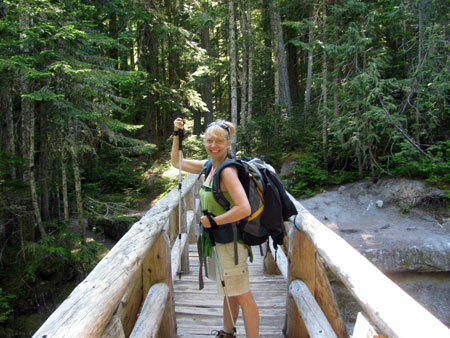 As we crossed over the bridge at the end of the hike, Eric snapped a photo of me and then noticed his boot felt strange. It turned out that his sole had come completely unglued except for a one inch section! We were so thankful we decided to go back the way we came up instead of taking the trail down a different ridge that would have added another 4-5 miles to our hike. Fortunately our local shoe repair guy fixed them right up when we got back from our trip. To get started on our sausage dinner I needed to roast some red pepper. We had a little less than half of a red pepper in our fridge that I just grabbed and tossed in our cooler before we left, not even sure what I’d do with it. But when we decided that we wanted to turn our sausages into sandwiches I knew that some roasted red pepper would be the perfect addition. I also had some sweet onions with the greens still attached from our CSA. I decided to just chop of some of the greens which I love using! It feels so right to use all of the onion and although they’re a lot thicker than scallions, they have great onion flavor, add some color and work really well in dishes where you want green onions as more than a garnish. If you don’t have fresh onion greens feel free to substitute with scallions. Plus because they came in a big package it came out to only 60 cents a sausage. I just keep them in the freezer and pull a couple out when we need something fast for dinner. They’re also great to toss on a grill if you invite someone over last minute. Can you tell by our exhausted eyes that the hike wore us out?! 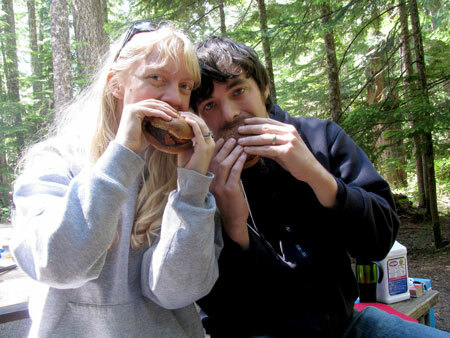 Fortunately these sandwiches were so easy to make that we didn’t have to reserve much energy for preparing dinner. They’re definitely a new regular on our summer meal cravings this year, hope you enjoy! 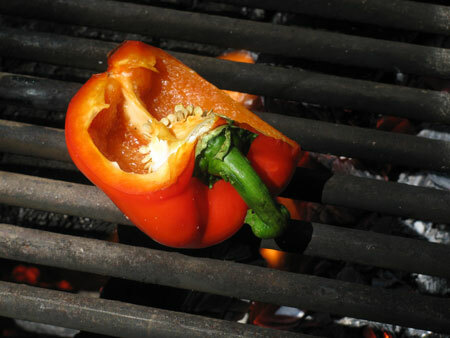 Place red pepper skin side down on a grill. If using a campfire place on a grate over the fire or skewer on a stick and hold over the flames. Roast the pepper until the skin is slightly charred. Remove from the heat and use a spoon to peel the skin off of the pepper. Remove the pepper stem and seeds. 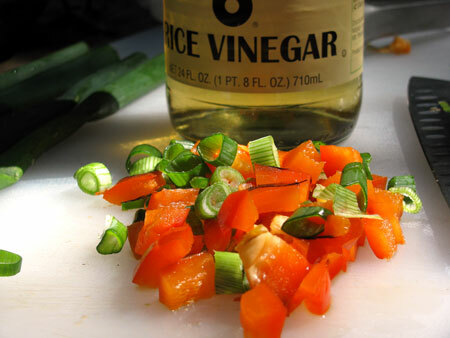 Chop the pepper into small pieces and mix with onion greens, vinegar and sugar. Let marinate while preparing sausages. 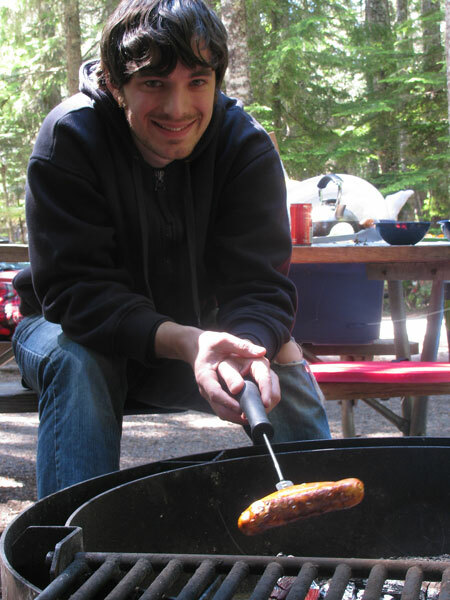 Grill or roast sausages over a campfire on a long fork or stick. As the side closest to the fire begins to char, rotate the sausage to heat the next side. Repeat twice until heated through with a slight char on all sides. Toast the buns over the fire. Slice sausages in half lengthwise and then horizontally. Lay the four pieces of each sausage out on a bun. Top each with half of the pepper and onion pickle. Spread the top buns with dijon mustard and top off your sandwich! Approximate cost/serving: At only 60 cents a sausage these were just 90 cents per sandwich. Can’t complain about that kind of price! Vegetarian/Gluten free: Feel free to use vegetarian sausage and gluten free bread for your sandwich. You two are adorable. I cannot believe he sucked it up with a sprain. Oww! I also love the lighting in your photos. It makes the food look so appealing. Also, I cannot remember if I mentioned this but I’ve you’ve subscribed to my RSS feed you may need to resubscribe. I switched over to feedburner recently and didn’t realize it was going to kick my old subscribers out. 🙁 I have the new link to subscribe on the top of my blog. You gotta love your alpine pics!!! and what a sandwich!! NOm nom nom!! I love campfire cooking! That looks so good. 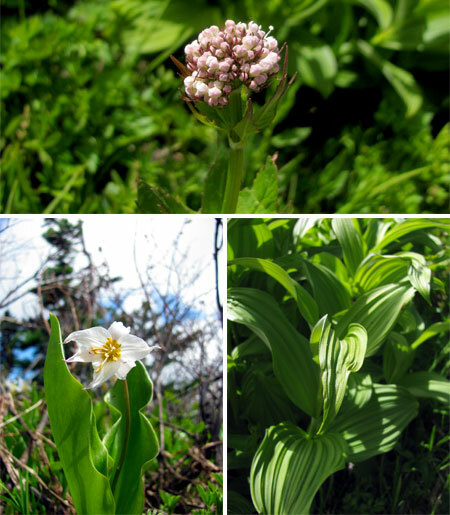 You guys are so lucky that you have that amazing wilderness right in your backyard. Very envious! I found your recipe just looking for others experiences headed up to Mildred Point! Great find!